I was married here. My children were baptized here. 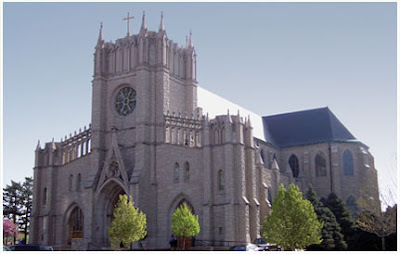 I taught CCD (religion classes) here last year to first graders. A lot of lovely memories. Tonight, we made a new one. G made his first confession this evening. Officially called "First Reconciliation", this is an 8-year-old's first chance to say "Bless me Father for I have sinned..." and later rattle off the freshly-memorized Act of Contrition before bolting the confessional. Oh, and to be absolved his sins. He had three choices of confessional priest tonight. 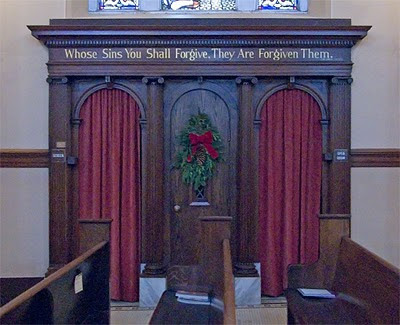 Two sat in chairs in far-off niches of the church and took confessions face-to-face (or really shoulder-to-shoulder so the kids wouldn't have to actually confess their heinous second-grade sins while looking a priest in the eye). One sat in a traditional screened confessional behind the red velvet curtains. G picked Priest #3 behind the curtains. Of course. He waited in line. And was nervous. I told him that Father Bob was super nice and he had nothing to worry about. He knew his lines backwards and forwards. And then he was finished. He found me in the pews. I asked him his penance - one Our Father and one Hail Mary. "That's it?" "Yep." "You must not have had many sins to confess. That's a light penance." "Yep." He knelt and said his prayers. We then had a few minutes to quietly chat while the other kids finished up. I asked him how it went. "Great," he said. He wouldn't tell me what sins he planned to confess before we went - so I tried again. "What sins did you tell Father about?" "Ummm, I told him about not listening in class because I was reading something because I really, really like reading. But the not listening wasn't good." "And I told him about that time that I diarhhea'd but didn't flush the toilet because I was really afraid I was going to clog the toilet." "About that time that, you know, when I didn't flush because I was scared the toilet would clog." 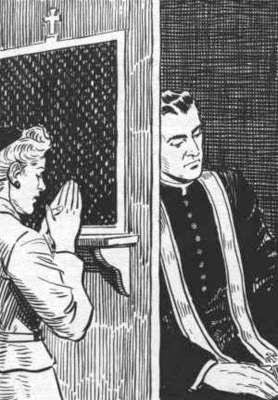 And, so, gentle readers - that is how Father Bob won the "Best Confession of the Night" contest when he got back to the rectory. Poop. God, I love our family... We can't avoid poop. No matter how hard we try. I want to know what Father Bob said, though. Cause, I mean, is that really a sin? What are they teaching in CCD these days?